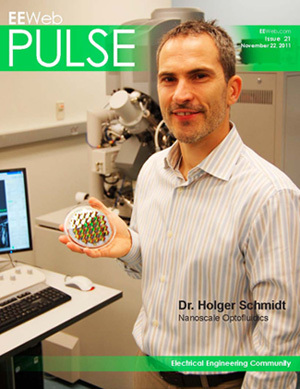 Electrical engineer Holger Schmidt was recently featured on the cover of Pulse magazine. A new class of biomedical diagnostic devices are among the possible uses for the optical sensing technologies developed in Holger Schmidt's lab at UC Santa Cruz. To help Schmidt assess the commercial potential of his work, the National Science Foundation (NSF) has awarded his team a $50,000 Innovation Corps grant. In addition to the funding, Innovation Corps teams participate in a specially-designed training curriculum and receive guidance from private- and public-sector experts to begin assessing the commercial readiness of their technology concepts. "We hope to gain a clear vision for our start-up company through talking to potential customers to find out what they really need and what type of molecular diagnostics we should be offering," said Schmidt, a professor of electrical engineering in the Baskin School of Engineering and director of the Keck Center for Nanoscale Optofluidics at UC Santa Cruz. Over the past decade, Schmidt and his collaborators have been developing chip-based technology to optically detect single molecules without the need for high-end laboratory equipment. Their hollow-core optical waveguides can be integrated into chips using standard silicon fabrication technology, enabling light propagation through tiny volumes of liquids on a chip. Diagnostic instruments based on these "optofluidic chips" could provide a rapid, low-cost, and portable option for identifying specific disease-related molecules such as genomic nucleic acids (DNA or RNA). Applications could include rapid point-of-care detection of infectious diseases or monitoring of various biomarkers to facilitate diagnosis and treatment of chronic diseases. Schmidt said the timing of the new grant is perfect. He and several of his long-term collaborators cofounded a company, LiquiLume Diagnostics, to commercialize their novel optofluidic technology, currently funded by a Small Business (SBIR) grant from NSF. The company's CEO, Philip Measor, obtained his B.S. and Ph.D. degrees in electrical engineering at UCSC and was a postdoctoral researcher in Schmidt's lab. Schmidt's Innovation Corps team includes Measor and Robert Dunkle, CEO of the corporate advisory firm A.B.E.S. Partners. Dunkle has been advising Schmidt's group pro bono for several months as an "entrepreneur-in-residence" at QB3, the California Institute for Quantitative Biosciences, a multi-campus research institute with a strong program of industry partnerships and start-up support. The Innovation Corps program selects up to 25 teams on a quarterly basis to assess the commercial viability of basic research previously supported by NSF. For more information, see the NSF Special Report on the program.